B's Beauty and Books: BOOK REVIEW: Beyond Midnight Asunder (A House of Crimson and Clover #3.5)!!! 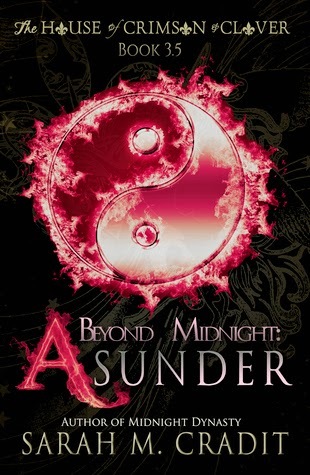 BOOK REVIEW: Beyond Midnight Asunder (A House of Crimson and Clover #3.5)!!! Broken and dispirited, the Deschanel family reels under the weight of a family curse. Lives were torn asunder, as their numbers diminished. Amidst their pain, another prophecy takes shape. One laid by the ancient druidic Quinlan clan, in a time long forgotten. Seers across the family have borne witness to fragments. Distraught by the loss of her soul’s true love, Amelia begins to dream of an unknown man and a woman, designated by fate to live their story over and over again, throughout time. Now, destiny reaches across the centuries. In the family’s darkest hour, a reckoning with the Empyrean Senetat is fast approaching. Hope becomes the necessary consolation for grief, as the Deschanels come together to make their loved ones whole, in order to face this uncertain future as a united clan. Unbelievably, this series just keeps getting better and better. I spent this entire book on the edge of my seat only to find that by the end of it, I was so unbelievably happy. I don't like to give away too much of the story but let's just say, in Asunder, this family starts to heal a bit it seems. So much had happened that they just needed to have a bit of a break. Jacob is my heart. I just love his character so much and to see what he is going through breaks your heart. Tristan, who is my favorite character from this series, has gone down a dark path and needs to find something to pull him out of it. So much going on with these families that you just are pulled in so many directions and your heartstrings are stretched to the point of breaking. Sarah makes you think and feel for each and every character. You leave breathless and emotionally invested. When I get one of her books I immediately have to read it. And I recommend you do the same! Absolutely fantastic and beautiful, I give this book 5 lipsticks!